Vs. Gallery is excited to present ‘New Evolution’ - the latest exhibition by Melbourne artist ‘Junkyprojects’ (Daniel Lynch). Whilst Daniel's art is often noted for its elegant simplicity, in this new body of work he introduces a new complexity to a number of his sculptures. Using found objects such as cutlery, hubcaps, broken toys, doorknobs and kitchen utensils, his assemblages take on striking and poetic characters - each with a life of their own. ‘The New Evolution’ portays an imagined dystopian future where the only existing life forms are composed of junk, refuse and the detritus of a decaying world. It is a prophetic statement for the future of life on our planet and a hope that existence must continue in some form or another. Unwell Bunny / Ed Bechervaise presents a retrospective back catalog of older and recent work in 'back and forward' showing a progression from street to gallery setting over a number of years. Emerging from the Adelaide 90's graffiti, Ed has chipped away making a name for himself in the urban contemporary art scene in Melbourne and further abroad showing work in Amsterdam, New York and Paris. 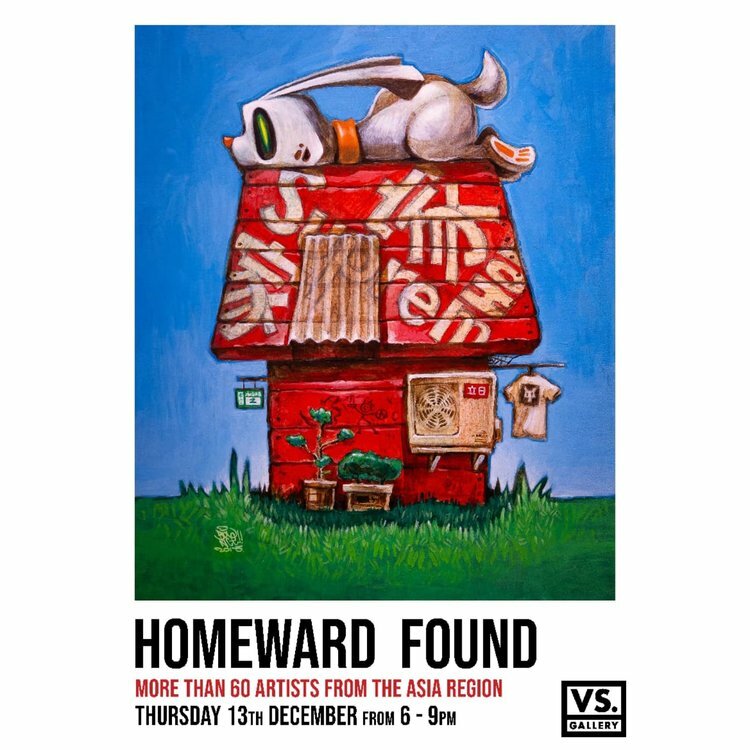 With the simple brief of “what does Home mean to you?” ‘Homeward Found’ brings together the work of over 60 artists for the largest independent exhibition of Asian urban, underground, street and graffiti artists to ever be held in Australia. Showcasing the vibrant creativity of our immediate neighbours, the exhibition brings to Melbourne some of the finest established and emerging talent from over twelve countries. The first in a planned series of events and collaborations, titled the ‘Sojourn Project’, Homeward Found aims to strengthen ties between artists across the Australian-Asian region through collaboration, exchange and communication. Exhibition Opening night - Thursday 13th December - 6pm to 9pm Show continues until December 23rd. Versus Gallery is excited to present ‘False Idols’, a new exhibition of over 50 sculptural ‘pop culture artefacts’ by Melbourne artist Adi. Each of his unique hand-made objects infuses elements of ancient idol worship with bold and colourful nostalgia for the cartoons and collectables of his childhood. These ‘new gods’ as he describes them, are drawn from the early mass-consumerist cultural explosion of the 60’s, 70’s and 80’s, and re-presented to us as the ‘False Idols’ that they really are. Juxtaposing the ‘old world’ reverence of anthropologic idol adoration with our modern iconic pop figures, ‘False Idols’ questions our relationship between memory, nostalgia and who or what we now exalt as our ‘new world’ deities. Every idol is a hand made and hand painted, wooden assemblage. An authentic and deliberate act, creating the union of maker and idol ensuring the utmost embodiment of the deities power as per the ancient practice and construction of idols of worship with the overall design aesthetic informed by modern Memphis object design and Brutalist Architecture. 'False Idols' encourages the viewer to reminisce and connect with a past not so long ago that more than likely affected us all, even if just a little. 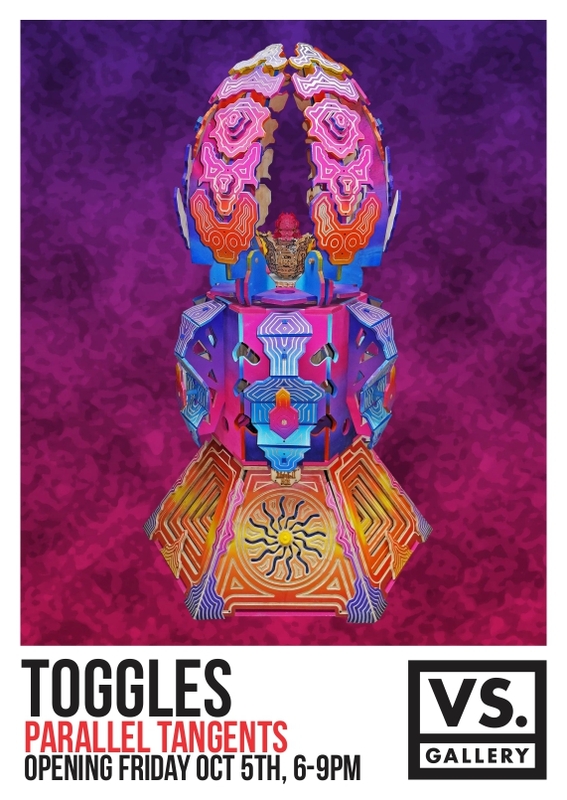 Vs. Gallery is pleased to announce a new exhibition by multi-disciplinary Melbourne artist Jasper Killick (aka, TOGGLES). ‘Parallel Tangents’ is his most recent exploration of visual phenomena and kinetic dimensionality in his unique kaleidoscopic style. Using hand-painted timber sculptures and reliefs, he creates psychedelic playgrounds that evoke other-worlds and new ‘tangential’ ways of engaging and engineering the world around us. With a BFA in Sculpture and Mechanical Engineering (Electronics/Robotics), Toggles immerses himself in machine processes - using digital designs created using CNC and laser cutting fabrication techniques. Over the last two years, his epic large-scale sculptures, stages and installations have been consistent features of some of Australia’s largest outdoor festivals such as Rainbow Serpent, Wild Horses and Synaesthesia. 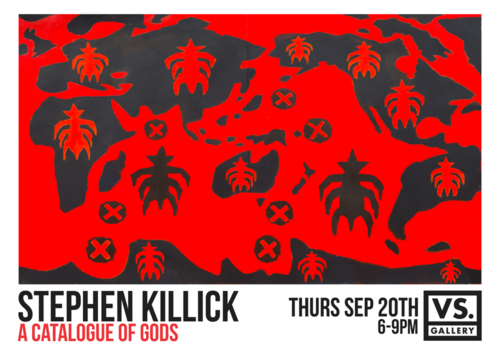 Vs. Gallery is excited to present a new solo exhibition by the renowned Australian pop-artist Stephen Killick. ‘A Catalogue of Gods’ re-interprets the symbols and icons of our mediated world into a bold and unique vision that maps the nuances of our dystopian landscape. Having exhibited and had residencies throughout Australia and overseas since 1968, Stephen Killick’s CV reads as a who’s who of Australian art. His work is in the collection of NGV, MOCA, AGNSW, QAG, and the National Gallery in Canberra. His commissioned sculpture work can be seen at the Brisbane International Airport, Heide park, Port Macquarie Library and notably at the Australian Pavillion at World Expo 88. His long time connection to Melbourne through numerous past exhibitions, studying at NGV art school, and local sculptural installations - makes ‘A Catalogue of Gods’ a refreshing home-coming for the artist and for us to celebrate his sublime and often satirical social commentary. Internationally renowned UK street artist Charley Uzzel-Edwards (PURE EVIL) returns to Australia with a new exhibition of his bold and engaging dystopian-pop artworks. ‘Sleepwalking Towards the Apocalypse’ explores the cult of celebrity and the darker side of our utopian dreams in the social-media age. Over 70 artists come together to participate in a survey exhibition of contemporary and underground art within the Melbourne and greater Australian community. Whether because of their challenging subject matter, jarring aesthetics or alternative approaches to their artwork, these artists can all be considered 'trouble makers'. The exhibition aims to open new dialogues between artists of different mediums and diverse practices within our local art scene, with the aim to promote a greater understanding of what is happening within our Australian creative community in 2018. Daniel Bombardier, known by his moniker DENIAL, is a Canadian graffiti and mixed-media pop artist. His work critiques consumerism and the human condition, with an emphasis on the negative effects of modern advertising, politics, and social media that contemporary society is often ‘in denial’ about. Intended as a conceptual means of marketing absurd-ism, DENIAL further challenges traditional notions of graffiti and public art through his bold and satirical visual subversions. Prepare to get weird, as Australia's favourite art purveyors Stupid Krap, bring the work of 3 of the most exciting international Pop Artists to Melbourne. 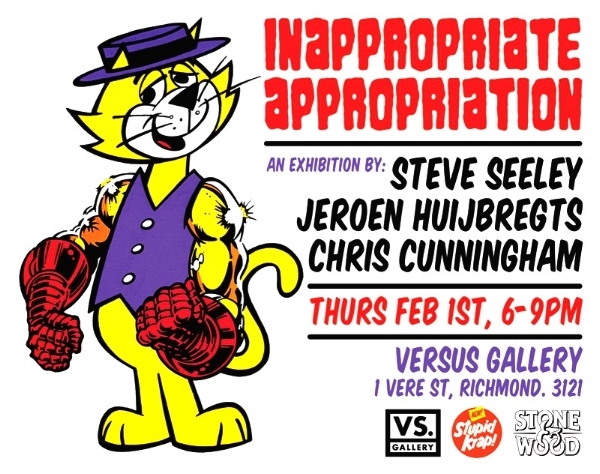 The unique group exhibition entitled 'Inappropriate Appropriation’, features over 50 pieces from artists Steve Seeley (United States), Jeroen Huijbregts (Netherlands), and Chris Cunningham (Ireland). Curated by Aaron Craig, the exhibition is the very first event for Versus Gallery, and promises to be the beginning of a new era in Melbourne art. Join us for a heavy dose of colour, vibrancy and Pop Art fun - with the tastiest of beers courtesy of Stone & Wood. You can view the exhibition catalogue HERE.